there were some 'racsit' rallies on the weekend.. THE woman, blonde and white, mounts the back of the ute outside Parliament House. She is the first to address the Reclaim Australia rally. Its aim is to ‘fight back’ against Islam and multiculturalism. “First I’d like to pay respect to the Wurundjeri people, the traditional owners of the land here,” she says. 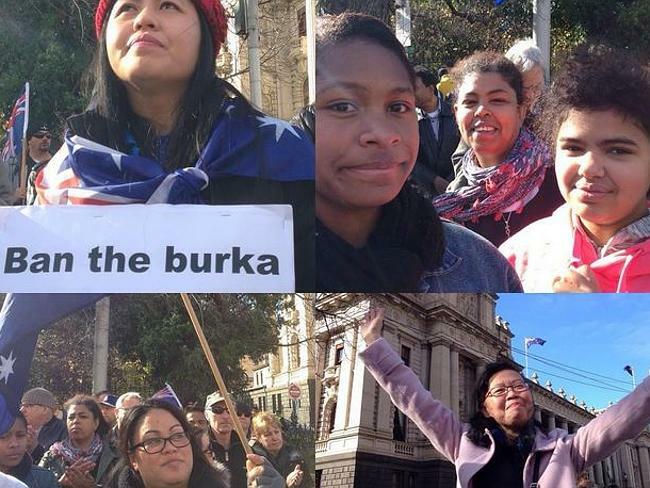 Strange way to start your anti-multicultural rally, I think to myself. I pull out my smartphone and report this to my Facebook followers (more about that later). A few hundred have turned up to support Reclaim Australia. They are protected by a double-line of police, holding back the thousands of pro-multicultural protesters. “Stand With Muslims Against Racism” reads one of their huge banners. Back here, on the anti-multicultural side, Danny Nalliah, a Sri Lankan immigrant from the Christian Catch the Fire Ministry, climbs on the ute. He begins a chant: Aussie! Aussie! Aussie! Oi! Oi! Oi! He warns of Sharia Law creeping into Australia. He says Muslims are coming here and not assimilating. What a tangle! If the Aussie way of life is leaving your grievances behind when you immigrate, maybe he’s the one not assimilating. Re: there were some 'racsit' rallies on the weekend..
People are just worried and only want immigrants to blend with them and not fight against them. It's a fair enough point and a fair enough emotion and a fair enough request. About half of these Reclaim Australia people are from Catch the Fire Ministry, or their political branch, Rise Up Australia. I thought this thread was going to be about "racist" being spelt wrong. they were in the minority the counter protest was bigger. What's in Melbourne to get their knickers in a twist? Some people simply don't like anyone or anything that's different to their accepted "norm's"..
ANYWAYS, LESS THAN 40 racist protesters turned out at the Newcastle showdown on the Sunday..
AND just over 50-or-so anti-protest-protesters..
AND around a hundred cops to maintain the peace ! AND I'll bet some from all three sides could be found at the same pub's later that arvo' !!! eddie wrote: People are just worried and only want immigrants to blend with them and not fight against them. That's all the blacks ever wanted over here. Fat chance the whites ever gave them the opportunity to "blend". The fact is that the 'melting pot' thesis is ethnocentric in itself. I remember the days in Tucson when signs were hung in bars and restaurants that said, NO SPANISH ALLOWED. Now, if they also hung a sign that said NO ENGLISH ALLOWED, we could get some serious drinking done. DISCRIMINATION against Aussie Aborigines re: public transport, shops, swimming pools, access to health and education was pretty much outlawed here during the 1960s (even though such despicable practices had already mostly disappeared around the cities and suburbs some decades earlier..). HOWEVER, there were still pockets of bad behaviour such as banning Kooris from pools and shops, making them sit down the back of the buses, and harassing them on purely racial grounds, still in existence in some rural and outback communities into the 1970s and even the early '80s ! THESE days there are still higher proportions of Aborigines in jails, suffering from alcohol and substance abuses, and then prone to violence after drinking, in comparison to the population at large..
AND generally finding it harder to access good medical care once they get away from the towns (actually, they share this problem with rural communities at large ~ the same "tyranny of distance" problems as experienced in rural and more remote areas of Alaska and Canada, and the likes of Russia and China..). AS FOR some people's negative attitudes re: employment opportunities, and the plight of Aborigines in general, well people's thoughts are still their own and many long-held fallacies and beliefs can take much longer to change than the laws themselves.. Such is human nature.